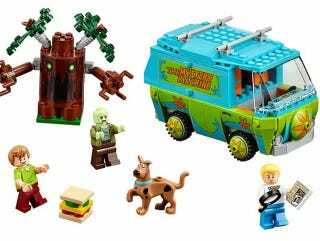 This morning, over at USA Today, we got a sneak peek of what's to come this August with the new Scooby-Doo Lego sets. In a new partnership between Warner Bros. Entertainment and The Lego Group, Scooby-Doo will appear in Lego form in an animated television special and some direct-to-video Lego movies. Fans always wonder which properties may come to life in LEGO form, and this year we are thrilled to bring all of the mystery, humor and hijinks of the Scooby-Doo universe to life in LEGO toys and animated content. I posted the five new set names and set numbers the other day during our London Toy Fair coverage. We now have some conformation on pricing on three of the sets for the United States.